Machu Picchu shrouds many secrets, visible only to those who enter with a pure heart. Only then can one ask the ancient oracles: Will hearts crushed by deception ever heal? And can a heinous sacrifice be stopped in time? 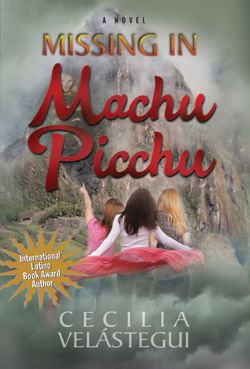 "Missing in Machu Picchu" by Cecilia Velastegui is not the type of book that I normally read. This stand alone book started off in a culture that I am not very familiar with but was able to immediately catch my attention and keep me reading with the large cast of interesting characters that are all quickly introduced. The amount of different points of view that take place in this book was a bit disorienting at first especially considering that several of the characters had very "Non-English" names that were hard to keep track of. Thankfully these characters were interesting enough to take a stand in my mind and become memorable. As the story starts out we find two elderly women, Taki and Koyam, trying to sell souvenirs to tourists that are visiting. At first they both seemed like cranky old women as they reminisce about the "old days" when they were younger and complain about the lack of respect in the younger generations and loud obnoxious tourists but we quickly find out that there is more to these elderly matrons than first meets the eye. These two lifelong friends easily became my favorite players in this high paced drama and I really enjoy what the author did with them. Along with the two old friends in this female dominated story are four 30-something year old women who have never met each other, but decided to join up and take a hike together through old jungle trails. Each of them comes from differant worlds and have lived differant lives with vastly polar personalities but they all have one thing in common. These four driven ladies have all grown tired of the online dating scene and want something fresh and want to leave the never ending disappointment of bad dates behind, or at least thats what they tell each other. The truth is that all four have hidden agendas and secret hopes for this trip and are willing to do whatever it takes to win the attention of their dashing trail guide Rodrigo. Rodrigo is charming and the dream of every single woman who meets him in this part of the world. He has agreed to take these women on a life changing hike. However the animosity of Taki and Koyam towards this young man as well as a vengeful past lover leads one to wonder if this simple dashing trail guide has something to hide. Overall this was an interesting enough book to read that I was able to finish it without too much effort. However the constant bickering between the four bullheaded women made it difficult to get through several stretches of the book. There where also several moments of fairly raunchy scenes that I was not fond of. The idea of sexual appetites actually seemed to be a driving force of this book and it was something that left me with a bad impression. The writing was well done and I legitimately enjoyed the ending, however the authors use of certain plot devices made this a "read once and done" book for me.